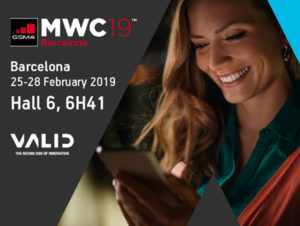 Valid is exhibiting at the upcoming Mobile World Congress 2019, the world’s largest technology event, held from 25 February to 28 February in Barcelona, Spain. Valid will be showcasing Mobile Banking solutions including Digital Banking Enrollment & Biometrics, Mobile Digital Journey for Telcom customers, eUICC Subscription Management, Smart Agriculture, and IoT solutions. Our Software & Services and Sales teams from across the globe will be in attendance to demonstrate the latest innovations in these solutions and various successful use cases. Valid is positioned as a technological partner, providing key services to help our clients address IoT by delivering secure, scalable, and interoperable state-of-the-art solutions. In addition, Valid is also pursuing our investments to develop new solutions that enable the digital transformation process of our clients to help them achieve a better customer experience.